With “Pink and Gray” (ピンクとグレー), director Isao Yukisada continues where he left off from his previous feature film, “Five Minutes to Tomorrow,” offering more insight into the messy lives of young adults caught in relationship angst. Like “Five Minutes,” Yukisada’s latest work is an adaptation, this time from a novel of the same name by J-pop star Shigeaki Kato of NEWS. Yukisada’s version of “Pink and Gray” launches into a sequence alternating between a dance performance and the moments prior to the suicide of popular idol actor Shiraki Rengo (played by real-life idol, Hey! Say! 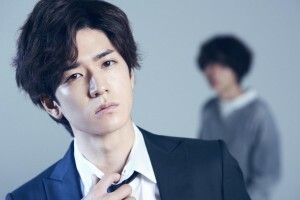 JUMP group member Yuto Nakajima). His body and a handful of suicide notes are eventually discovered by his best friend Daiki (Masaki Suda), who tries to determine what happened by recalling the evolution of their relationship over the past 14 years. It turns out that Shiraki Rengo was the eventual stage name for a boy named Shingo, childhood nickname “Gotch.” Daiki went by “Riba,” and the two established a fast but never fully explored friendship with a girl named Sally (Kaho). The story of the two boys rapidly unfolds after he and Riba are scouted, and tapped for bit parts in films. Eventually, it is Gotch, now as Shiraki Rengo, who becomes the star, while a jealous Riba struggles to even land roles, resulting in a period of time when the two are not on speaking terms. Even with a not-quite-there love triangle and bit of curiously underplayed tragedy – in addition to the suicide – thrown in, the retelling of Riba and Gotch’s relationship favors convention. During this reconstruction, it can be tempting for the viewer to be lulled into casual, passive observation. Don’t fall into this trap. When Rengo’s suicide is shown again, the story then turns on its head at only the halfway mark of the film. It punishes those who allowed complacency to seep into the viewing experience, leading to an inability to recall details that are shown again, literally and figuratively, in a different light. Even elements that seemed extraneous such as Sally, a blank slate and seemingly a mere plot diversion, contribute to the ensuing madness. Revealing details beyond this point would give the story away, but ultimately “Pink and Gray” is a case study in how simultaneous identity loss and theft, combined with crippling insecurity, can lead to dangerous obsession. The lesson learned from its bittersweet conclusion: what is on the other side of the fence isn’t always better. “Pink and Gray” was a selection of the 2016 Hong Kong International Film Festival.